The Royal Palace at Bang Pa-In has a history dating back to the 17th century. According to a chronicle of Ayutthaya, King Prasat Thong(1629-1656) had a palace constructed on Bang Pa-In Island in the Chao Phraya river. A contemporary Dutch merchant, Jeremians van Vlit, reported that King Prasat Thong was an illegitimate son of King Ekathotasarot(1605-1610/11), who in his youth was shipwrecked on that island and had a son by a woman who befriended him. The boy grew up to become the Chief Minister. After having usurped the throne, he became known as king Prasat Thong. the King founded a monastery, Wat Chumphon Nikayaram, on the land belonging to his mother on Bang Pa-In Island, and then had a pond dug and a palace built to the south of that monastery. The chronicle records the name of only one building, the Aisawan Thiphaya-art Royal Residence, which was constructed in 1632, the year of the birth of his son, the future King Narai ( 1656-1688 ). It is not known whether or not the palace was in use till the fall of Ayutthaya in 1767. However, by 1807, when the kingdom's best known poet, Sunthon Phu, sailed past Bang-Pa-in, only a memory of the palace remained, for the site was neglected and overgrown. Today the palace is used occasionally by Their Majesties King Bhumibol Adulyadej ( Rama IX) and Queen Sirikit as a residence and for holding receptions and banquets. 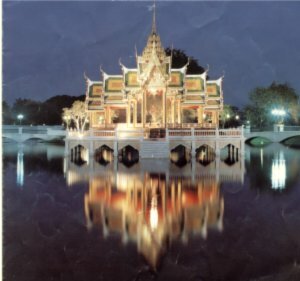 PHRA THINANG AISAWAN THIPHYÄ-ART is a Thai-style pavilion with four porches and a spired roof built by King Chulalongkorn in the middle of an outer pond in 1876. It is a copy of the Phra Thinang Aphonphimok Prasat in the Grand Palace, which was built by his father, King Mongkut, as a pavilion for changing regalia before mounting a palanquin. King Chulalongkorn named this building Aisawan Thiphya-art after King Prasat Thong's original pavilion. This pavilion now house a bronze statue of King Chulalongkorn in the uniform of a Field Marshal which was set up by his son King Vajiravudh ( Rama VI ). 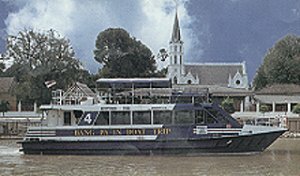 WELCOME TO SIGHT-SEEING TOUR AROUND WAT NIWET THAMPRAWAT ISLAND BY THE LUXURY AND INSURANCE JET BOAT, IT COST 680,000 US. DOLLARS,TAKEN FROM THAMES RIVER, ENGLAND. THE BOAT IS SERVED WITH SPECIAL PRICE 30.-BATH/EACH. STARTING EVERYDAY 9.00 A.M.-3.00P.M. (EVERY AN HOUR) AT BANG PA-IN PIER, AYUTTTHAYA PROVINCE. FOR MORE INFORMATION AND RESERVATIONS, CONTACT BANG PA-IN PALACE TEL. (035) 261044.